In the wee hours of last Tuesday morning my friend Stephanie and I arrived back from our trip to the desert, Palm Springs and Joshua Tree, to visit a friend. We knew it would be hot but you know, you forget how hot, hot is! Our 5 days ranged from 104 to 109 degrees, with nights in the high 80s! It was too hot for Stephanie so she spent most of the days inside beside a fan. Pool water was not much of a relief as it boarded on bath temp water. I had to get out and made several trips to the town Joshua Tree, twenty-five miles from Palm Springs. 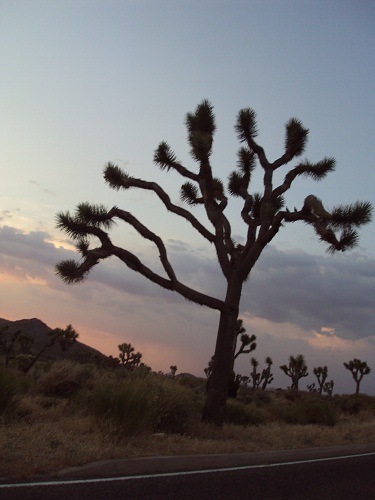 The two main reasons people come to the town are Joshua Tree National Park and the Joshua Tree Retreat Center or The Institute of Mentalphysics. Joshua Tree Main Street has a small selection of cafe, restaurants and bars, craft and souvenir, bank, gas and necessities and not much else. Yubba Valley just six miles away provides the locals with all their shopping needs. The Retreat Center of 400 plus areas hosts classes, gatherings and festivals throughout the year and people come from all over the world. I was told the National Park brings 200,000 plus visitors to this little town, although very few actually stop here, they just keep of driving! I learned to appreciate the stark beauty of the summer desert in New Mexico. Dry parched soil. 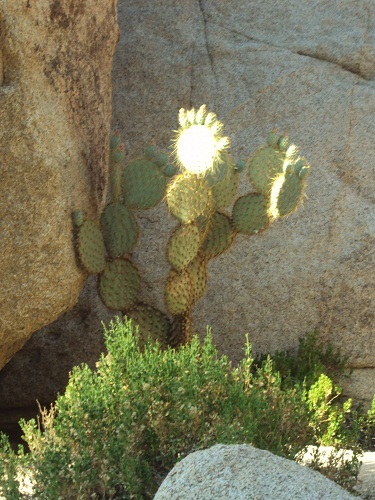 Plants and cactus varieties have adapted and sustained themselves in spite of the dryness and heat. 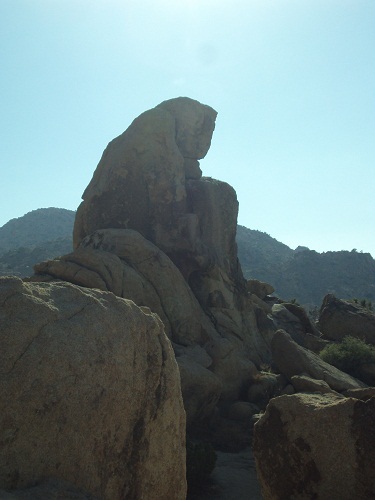 Amazing rock formations dot the landscape and offer protection for the occasional oasis that appear out of nowhere, offering wildlife the blessing of water. For me, walking, sitting and taking in the beauty of nature, feeling the ancestors in the wind and listeni ng to the calls of wildlife bring peace and clarity not found in the everyday hustle bustle world. The other morning started with a major weeding project before installing a drip system in the veggie garden. A couple of weeks ago the then “innocent looking” weeds didn’t look too threatening but after lovely sunshine, lots of water and a week away the growth was tremendous. At the same time the veggies had made good progress but not to the same degree. This year as a medicine woman gardener I have marveled at the fact we have had no problems with destructive bugs, fungus or gophers, even though there are holes in many of the beds. We have used nothing at all and the soil seems balanced and accommodating to all varieties. Loving medicine magic seems to work except with the weeds! “Walking for World Peace” is the name of this project and will be initiated this weekend at the Mystic Garden Gathering in Selma, Or. (A gathering I never expected to ever attend….shows what I know!) The new focus of this music gathering will enhancing and understanding community more, empowering through great and diverse music, yoga, meditation, dance and sharing without drugs and alcohol. Last night as a few of the volunteers shared fabulous pizza cooked on the open fire, rain drizzling in the background (it later rained all night), I listened and learned from the young adults present, the ages of my sons, some of their desires, fears, understandings and realities. And I understood why I am to be present. They want a better world, not most of the garbage that is being presented for in 30 years this generation will be the leaders of the world….a very new world of their creation….not the one that is crumbling before our eyes. They know, as so many of us already know, change happens from within first, to then emanate out into the world through actions, integrity, purpose and vision. Walking the labyrinth is a practice to get in touch and claim the grounded self. “Walking for World Peace” will be a video diary of everyone who participates beginning this weekend and coincides with Dr. Emoto’s Prayers for the Waters of Japan and the World on July 25th. On Monday I’ll be at Aquarius Books in Grants Pass, OR and the following weekend in Mt Shasta at a City Park festival. After that I am to take the labyrinth down through various communities in California and then beyond. Each month I ‘ll put out the video diary of all who are sharing in Walking for World Peace.” To support the travel and editing expenses of this project each person who walks the labyrinth will be asked to gift a donation as an energy exchange…..all amounts will be accepted in great gratitude. World Peace WILL NOT come through the lack of war, anger, greed, corruption and power. It will come and does come as EACH PERSON grows in peace within themselves, in understanding of themselves and their roles in life…..a not so easy and never ending seeking journey…..even when one leaves this life it continues in more earnest. Another topic! If you would like to host or have Waling for World Peace come to your community please let me know. Young or old, rich or poor ….we are all equal in the eyes of the Divine Creator by all names, colors, creeds and beliefs!